Desert Eco Tours providing pristine event and activity services for groups in Israel. Including special events on Masada and the Dead Sea area. All aspects are tailored to suit the requirements of each client. In addition to catering and function services we provide outdoor activities for participants throughout the Negev. Tell us a little about your group for more information on our group services, contact us. Our group tour services throughout the Negev are flexible and dynamic and we make sure that each group receives the optimum tour services; the best places and perfect timing make a desert tour a magical experience. Route 2: We board the huge Safari vehicles in Masada and set of on a full day tour that centers around the small crater and Nahal Zin, the largest in Israel. We explore the highlights of the Negev desert stopping en route for short walks in the nature and a hearty desert buffet lunch. Back to Masada by evening. This 2 programs incl. Safari vehicles of 32 or 45 seats, a guide on each vehicle, a guide and a picnic lunch. Departing morning from the Dead Sea or Mitzpe Ramon area, we board jeeps and explore the Negev's geological wonder, The Ramon Crater. From the bottom of the crater we ascend the craters walls by way of 'Noah's ascent. Having reached the top of the craters cliffs we drive along their edge till Mitzpe Ramon. From here we head west to the Eilot* Valley near the Sinai border. In this valley we see Atlantic Pistachio trees dating back 2000 years and enjoy another incredible ride through the stunning nature of the area. We exit the Eilot valley right beside the Egyptian border and head back during the late afternoon to Mitzpe Ramon. Lunch is incl.- picnic style in the desert. This half day jeep tour from Mitzpe Ramon heads deep into the Mitzpe Ramon Crater. The tour begins with a ride along the edge of the crater's cliffs taking in the fabulous views. We descend the crater walls to the spring of Sahronim. Moving on to the Canyon of Paresat Nekarot where we hike in the canyon. From here its back onto the 4x4 trail to the dramatic Noah ascent which works its way up the sides of the Ramon Crater along a scenic 4x4 trail and towards Mitzpe Ramon. Returning after 4.5 hrs to Mitzpe Ramon town. This Negev tour is a private jeep tour and can be booked for morning, afternoon or sunset. Departing early morning we board 4x4 jeeps to explore off-road the Negev's most renowned geological wonder, The Ramon Crater. From the bottom of the crater we ascend the steep sides on the trail of Noah's ascent. 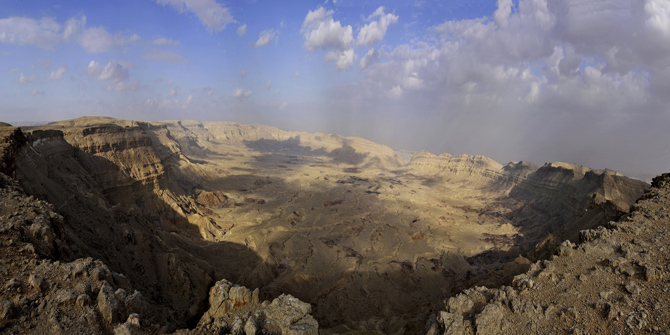 Having reached the top of the crater we drive along a scenic route on edge of the crater's cliffs towards Mitzpe Ramon. From here we head west to the Eilot* Valley near the Egyptian border. This valley is one of the most scenic in the area and here we see Atlantic Pistacia trees dating back 2000 years and enjoy an additional 4x4 jeep ride through the stunning nature of the area. We exit the Eilot valley by the Egyptian border and head back during the late afternoon to Mitzpe Ramon where we complete the tour..
Tour in the Eilat Mts.